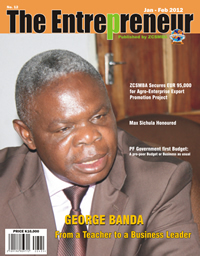 The Eighth (8th) national BEE for micro, small and medium enterprises (MSMEs) will be held from Friday, May 18, 2012 and ends on Sunday, May 20, 2012 at KIFCO Grounds in Kabwe. This year’s BEE will be held in conjunction with the Kabwe District Business Association and about 200 small and medium sized companies from various parts of the country are expected to exhibit at the event. The BEE is the only national exhibition solely for the MSMEs, therefore, it offers unique opportunities to micro, small and medium business men and women to showcase their products and services. It is, therefore, a pride of ZCSMBA and we hope that this year all member MSMEs will make a very big difference by attending and exhibiting at your very own show. The Central Province Business Associations are especially urged to turn out in numbers. Or Business Association within your area. ZCSMBA has an affiliate Business Association in all Districts. Designed & Hosted by Puremarks.com © ZCSMBA. All rights reserved | "To be the major intermediary business organisation that unlocks the power of the Micro, Small and Medium Enterprises (MSMEs)"